An origami crane mobile can add a sculptural dimension to any room. If you have a collection of origami cranes, a mobile is an apt way to display them. Hang your mobile near a window to help beautify an unattractive view, in an underused corner to wake up the space, or hang a small mobile over a child's bed for soothing visual stimulation. This inexpensive project provides delightful results without considerable time or effort. 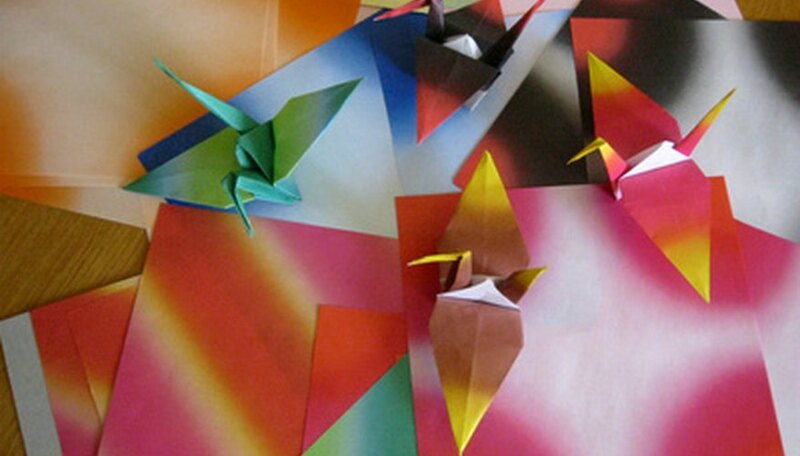 Collect origami cranes for your mobile. If you do not have any origami cranes, use a template and paper to fold as many as you need in the colors and patterns you desire. Thread the needle. Suspend the cranes vertically on the thread by pushing the needle through their bodies from the bottom towards the top. Tie a knot above and below each crane to hold it in place. Add as many cranes as you would like to one or several lengths of thread. Create a square with chopsticks and tie it together at its corners to create a sturdy base for the mobile. Tie ribbons to each corner of the chopstick square and join the ribbons at the top by tying a knot. This is where you will attach the mobile to the ceiling. Tie the threads containing the origami cranes to each side of the chopstick square until you are satisfied with the design of your mobile. Attach the mobile to the ceiling using a ceiling hook.